FOR the sixth sale in a row all Burrawang Dorper and White Dorper rams sold for a total auction clearance for the 13th on-farm sale at Ootha on Monday, March 18. Returning buyers from NSW, Victoria, and South Australia placed a solid bottom to prices resulting in all 90 rams offered selling to a top of $4000 to average $1492. Dorper rams were keenly sought after with 57 selling to $2700 and averaging $1576 while White Dorper rams sold to a sale top of $4000 and averaged $1347. Peter and Penny Dagg, Eastern stud, Murrumbateman, paid the top money the White Dorper son of Burrawang Eminem and from a Burrawang Scion sired dam weighing 79 kilograms and displaying an eye muscle depth of 37 millimetres. 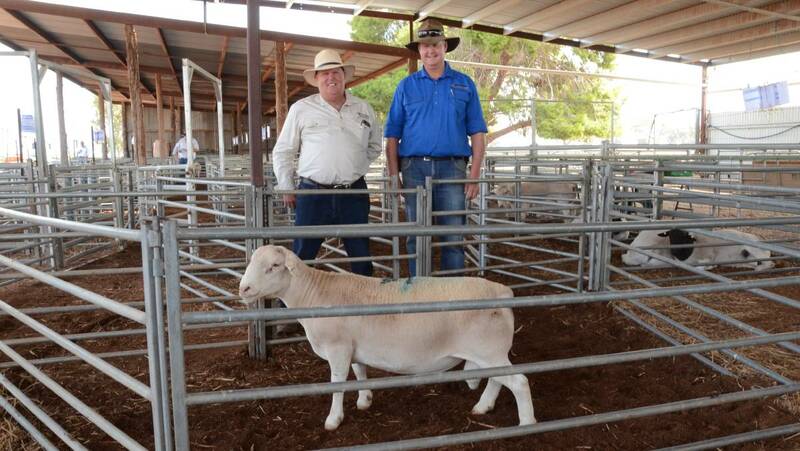 Pictured: Burrawang stud’s Mal Brady and stud manager Wicus Cronje with the $4000 top-priced ram, a White Dorper purchased by Peter and Penny Dagg, Eastern stud, Murrumbateman. Click here to read the story by Mark Griggs for The Land.